With nine divisions, we will make every effort to guarantee you are placed in a division vs. like competition. Additionally, with enough interest, divisions will be divided into A and B divisions. Teams play for a championship in all divisions. All teams are scheduled five games each, plus top teams will play a sixth championship game. Games consist of four, twelve-minute running quarters. Championship T-shirts to all division winners! The Sportsplex at Matthews- 11210 Brigman Rd, Matthews, NC 28105 Map It! ALL games in ALL boys division played at the Sportsplex at Matthews. 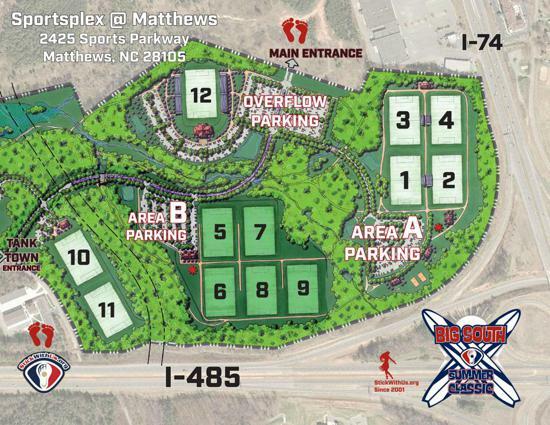 Eleven turf fields at ONE location with plenty of parking. Best tourney venue in the southeast. Championship games played on the brand new Stadium Field. All games played on sports turf and all games guaranteed!